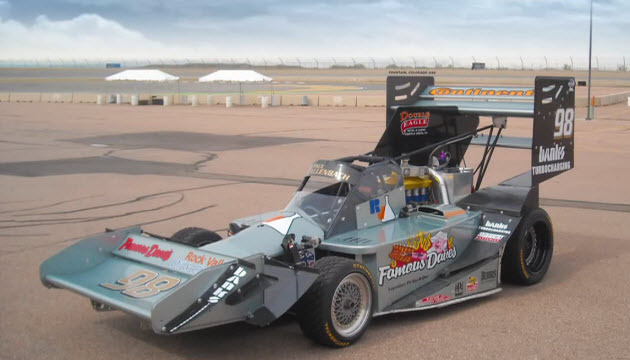 Last year, at the 2010 Pike's Peak International Hill Climb, our very own Drew Phillips ascended the mountain to chat with some of the race's drivers. The most exciting class is arguably the Unlimited group, which run insanely powerful machines driven by mad men looking to break the elusive 10-minute mark. In 2010, only three men strapped into Unlimited-class racers, and one of them goes by the name of Paul Dallenbach. "My car is good on hard surfaces... but I really need to come back with some factory help on an engine. That's my big thing that's hurting me right now. I'm running the same engines I've had for ten years. They're great engines, and they have great torque, but I really need something that's more reliable." Well, Dallenbach has a helping hand for the 2011 race. Two of them, in fact, and they've been provided by Banks Power. Banks has teamed up with the Dallenbach Racing Team, and the two are sharing a wealth of turbocharging and engine-tuning knowledge. As a result of the twin-turbocharged shove, power has been pushed from 745-horsepower and 650 pound-feet of torque up to 1,307-horsepower and 1,206 pound-feet of torque. That's a healthy dose of added scoot. Paul Dallenbach teams up with Banks Power to tackle Pike's Peak originally appeared on Autoblog on Tue, 31 May 2011 19:59:00 EST. Please see our terms for use of feeds.